Ah, this stamp set called Pony Party is very cute and brings back memories of the My Little Pony‘s of the 1980’s!!! However, like many great toys of the 80’s, My Little Pony is popular for our own children! I remember that my friend had a couple of My Little Pony’s … I never did, but was ALWAYS jealous! Now I can stamp my own! I’m not sure if you can make it out in the photo, but the cardstock with the saying at the bottom of the card has deliberately been curled and I’ve also curved it as I adhered it to the card. Here’s a trick you can try next time you use a Roller Wheel… If you wheel your design diagonally across your cardstock you’ll end up with a better finish than if you roll your wheel horizontally (from left to right ) across your cardstock. It obviously works best with a random or swirly image rather than a wheel with writing on it (cos that would just be down-right weird and also slightly tricky to READ!!! )… give it a go! I think the reason is that it tricks the brain and you can’t “see” the join of the wheeled images – especially useful if your cardstock is wider than your wheel and you need to do two or more “runs” over the cardstock to cover it. You can see by the direction of the little cloud on my card above that I’ve wheeled it diagonally. I showed some workshop guests the difference between covering a piece of cardstock by wheeling horizontally (left to right, parallel to the long edges of the cardstock) and then compared it to wheeling diagonally – the difference was huge! Naturally when you’re using a wheel there may be some wider gaps between each run of the wheel, so rolling diagonally tends to hide these small gaps a lot better than if you were to roll parallel to the cardstock. Again – I love finding ways to hide my mistakes!!! Stamps: Pony Party, Dream standard wheel. Cardstock: Elegant Eggplant, Lovely Lilac, Pixie Pink, Whisper White. Ink: Basic Black, Pixie Pink, Elegant Eggplant, Certainly Celery. Accessories: Blender Pens, Scallop Edge Punch, Corner Rounder Punch, Elegant Eggplant Ribbon, 2 Way Glue Pen, Dazzling Diaomnds Glitter. My beautiful dad gave me the best news today – his cancer is in REMISSION! It’s gone. The chemo worked! He’s having his last cycle of chemo tomorrow – just as a ‘booster’ shot really, but he’s all clear. Dad was diagnosed with Stage 3 Non-Hodgkins Lymphoma right on Christmas after struggling with various symptoms for months. We all had a difficult time coming to terms with the news, but once that diagnosis was FINALLY made things moved along very quickly. From that first day with the confirmation of NHL in the doctor’s room at the Hospital there was always a lot of HOPE. We were all very optimistic and up-beat about it and knew it was just something we had to get through and that dad would do what had to be done. In the beginning, dad was very weak and couldn’t even drive or walk without getting exhausted, so I became the transport for mum and dad – which I felt at that time was the only thing I could do – I couldn’t help in any other way, so this was my ‘bit’. I keep saying I was fortunate to go along with mum and dad to each appointment and chemotherapy cycle because I was then able to see, feel and take in all the positives that the staff gave out either deliberately or just by their beautiful natures. For every bit of hard news or side effect from medication there was always a positive piece of information or a suggestion about what to do to counter-act side effects – everything was balanced (perhaps even tipped towards the HOPEful) and there was ALWAYS so much support from the wonderful staff. I think that if I hadn’t been able to hear the ‘good’ news with the ‘bad’ news, I could easily have fallen into the depths of fear and hopelessness. So, yes, although no one wants to watch someone they love go through chemo, I feel blessed to have been able to share these moments with mum and dad. I’m getting teary even now, which I know is just relief and joy at dad’s wonderful news but perhaps it’s also a release of the anxiety that I was holding in all this time. We’re so lucky that treatment worked – I have my beautiful dad and I’m the luckiest person in the world today. Last month, I took this photo of dad and his three “girls” at the Lyell McEwin hospital – these nurses kept our spirits high and brightened each chemo day with their laughter, cheeky-ness and smiles. Oh the laughs we had! Most often it was at dad’s expense, but he was ‘hooked up’ and couldn’t really fight back. LOL. They truly are angels of HOPE. I can’t even say how relieved and happy I am. Thankyou to all my friends and customers who have kept me and my family in your thoughts, it has been truly appreciated. Isn’t this robot the cutest? This set is called Lots of Bots and is available from the Autumn-Winter Mini Catalogue. I KNOW I’ve said it before, but I LOVE colouring in stamped images – I find it very relaxing and will often sit and stamp out a whole sheet of cardstock and then colour in the images while watching/listening to the telly when hubby is out on a Wednesday evening. I LUUUURVE *MY* Wednesday nights!!!! – Not ‘cos hubby is OUT but ‘cos of the stampin’-time – thought I’d clarify that! LOL. Lots of Bots has this cute little stamp that has 3 nuts and bolts on it and I’ve randomly and repeatedly stamped that image over the Tangerine Tango cardstock to create a stamped background. If you look REALLY carefully you can just see it. I’ve also gone for texture, hardware and staples on this card as it adds to the whole technology/robotty theme. Cardstock: Kiwi Kiss, Tangerine Tango, Pacigic Point, Whisper White. Accessories: Kiwi Kiss Striped Ribbon, Blender Pens, Jumbo Eyelets, Crop-o-dile, staples, Big Shot, Polka Dot embossing folder, Corner Rounder Punch. Hubby and I celebrated our twelfth wedding anniversary yesterday!!! WooHoo!! I *DO* feel very lucky every day; he’s my Best Friend! And we have two beautiful children… we’re so blessed. Here’s a simple card with the Flower Fancy stamp set , Very Vanilla cardstock as my base card with Chocolate Chip cardstock, Baja Breeze and Chocolate Chip ink. I LUUURVE these colours. If you have a Stampin’ Up! 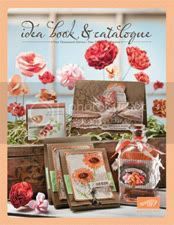 Idea Book & Catalogue, check out page 7 – I pretty much CASED the Pillow Box but made my version for a card. Baja Breeze and Chocolate Chip look so good together – even if I do say so myself. I’ve lightly coloured in the small flower with my Blender Pens and Baja Breeze ink. This is a Two-Step set and is so pretty. We met up with my cousin from England last Sunday… I was 14 years old when I saw her last – WOW it’s been 23 years since we moved to Australia!!! It just doesn’t seem that long ago to be honest. It was terrific meeting her again after so long – it was lovely to hear her accent and chat. She brought her 21 year old daughter with her (who is just adorable), and we had a lovely day with my mum & dad and my brother and his family… we had a picnic at Glenelg – and the weather stayed good!!! We’ve caught up with friends during this week and will visit Linda and her son Tyler tomorrow with my friend Maria and her daughter for a play-date. *phew*. AND…. I still need to take the children clothes-shopping before school. I have to take my daughter shopping with me now to try on trousers and jeans as she’s quite slim, but tall for her age – and the elastic/adjustable jeans just don’t fit right if I buy her the size as per her age. GRRR. It was always so much easier to be able to just buy off the rack (my choice of style – YAY!!) and know that the clothes would fit – now I have to take the children and that means we’re hitting the next stage of their growing up…Ahhh, now I’ll be getting her opinions about styles and designs *rollseyes* LOL. Fun, fun, fun. I hope you’ve been enjoying your school holidays (if you have time off!!). Birthday card for a bloke. I made this card at the same time as the very similar card for my brother, last week. This one is for my brother-in-law. They’re not going to cross paths and I really doubt they follow my blog *snort* so it was safe to make the same card for them both!! I really like the look of these colours together (Sage Shadow, Old Olive, So Saffron and Chocolate Chip.) I was a bit unsure about using yellow on a masculine card, but I think it works! So Saffron is such a soft tone of yellow that it doesn’t look out of place. A bit of metal hardware and smal piece of ribbon really finished it off. Crayon Resist is a very pretty and easy technique (once you know what you’re doing. LOL!) and is a lot of fun to play around with. This card is made by stamping on either Whisper White or Glossy White cardstock with Basic Black ink. You will need a WAX crayon too. It’s very important it be a WAX crayon – not a Watercolour crayon – I learnt the hard way. Raid the children’s Crayola crayons!! Choose a stamp that has an element that you can colour in with the crayon, like the image above so that there is some white space for the crayon resist technique. Stamp in Basic Black ink and then colour in with the WAX crayon the areas that you want to remain white. Use a Stampin’ Sponge or Brayer to rub or roll your chosen colour of ink over the white cardstock. When you’re happy with your ink coverage (play with it a bit to see what differences you can come up with), and then simply wipe off the crayon with a kitchen paper towel. The areas under the crayon will remain white and give quite a pretty look to your card! For the card above, I used Whisper White cardstock, Basic Black ink, a white Wax crayon, Pumpkin Pie and So Saffron ink sponged over the white cardstock with Stampin’ Sponges. The stamp set is another of my favourites (aren’t they all? *laughs*) called Scribble This which is available in the current Idea Book & Catalogue. The colours are softer and I’ve used Apricot Appeal, Taken with Teal and Certainly Celery.You can see the circular shapes that have been left by the motion of rubbing the ink over the Glossy cardstock with Sponges – but I like the effect. By rubbing over the cardstock with more ink you can deepen the depth of colour in certain areas, so you’ve quite a bit of control about how vibrant you want the card to be. The ink takes that tiny bit longer to soak into the Glossy cardstock so there’s more ‘play’ and ‘smooshing’ of the ink over the cardstock before it ‘sets’. If you see anything you like on my blog, please don’t be shy about leaving me a comment – I’d love to hear from you! Comments make me happy!! The Easter Bunny visited us this morning, leaving sweet treats for the children down amongst the gum trees in our back block… what a lot of fun it was watching the children racing from tree to tree to see if there were any tiny eggs hidden in the undergrowth. This card uses Wagon Full of Fun from the Summer mini (now retired), and the Bold Brights inks and cardstock – Real Red, Green Galore, Tempting Turquoise and Yoyo Yellow. Don’t you just love the glitter on the eggs? 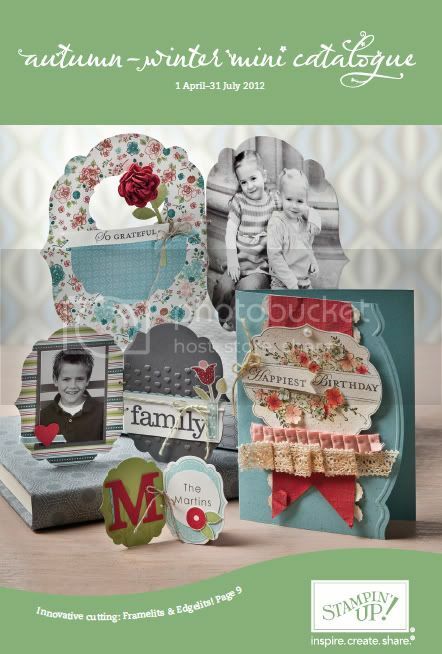 I’ve also embossed the top layers of cardstock with Polka Dots in the Big Shot. This is such a cute duck. I’ve gone for a very clean and simple look here. Only Orange, Yoyo Yellow and Whisper White. I’ve coloured both the ducky and the eggs in the previous card with my Blender Pens and the ink pads. I thought I’d use the Loads of Love accessories set and put a little pile of Easter Eggs on the window sill of the Window Dressing Hostess set. Cute. GAH – the quality of the photos is awful! I’ll see if I can get better shots and edit this later for you. Again, I’ve kept the design very simple and the colour scheme is minimal. If you can just make it out, I’ve embossed the Whisper White cardstock with Polka Dots. If you like the bow on the top right hand side, I learnt how to make it by following Teneale Williams’ instructions. You’ll have to check out her blog for her Tutorial on how she makes her perfect bows. Stunning!! I hope you had a wonderful Easter Sunday and that the Easter Bunny brought you a little something too. Yum. Here’s a quick look at a couple of die-cut Top Note shapes in a range of Earth Elements colours. I cut the four coloured pieces of cardstock in ONE go! I’d probably only cut two or three at a time in the future to ensure that the piece which is ‘cut last’ has good indentations and perforations around the edge. I also used the Extra Large Two-Step Bird punch to embellish the front Top Note. All you need to do is punch the Bird Punch through three different colours of cardtsock and layer them however you please. You’ll end up with three of each image to play around with! I’ve bound the Top Notes together with a Jumbo Eyelet and a ringbinder to use as my sample of the Top Note die to show Workshop guests.